Source: Don Olsen (collection), Al Rose, Al Phelps, San Francisco Public Utilities (1923), Louis Stein, Charles Anderson. An introduction by Warren Haack begins this program. The film collection of Don Olsen, supplies the images of this show. Contains five operations in Volume 2. There is a number of rarities. Plenty of amateur film, but these are mostly, hard to find lines. A collection of films, in widely varying years illustrate these lines. Color, black & white films, plus b&w still photos. Film quality ranges from fair (1923), to excellent. Many handheld shots. Be ready for some shaky cameras. The later years offer the best quality of film. Audio has dubbed, train sounds and there are musical segments. Optional on/off narration. There are nice maps in the show. They help with the far flung shortlines. They even illustrate, direction of travel and other line locations.On screen graphics further location awareness. Well done! Warren Haack gives a fine narrative to the program. He keeps the show interesting. Mixing history with film and some photos, provides a good foundation for understanding these railroads. His clear explanations will have any viewer able to follow and enjoy the trains. 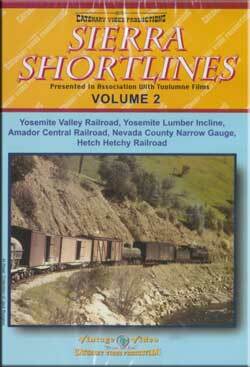 Yosemite Valley is the first railroad chapter. Color film, with some b&w. Photos show older power and some stations. The 1944 and 1945 fantrips give a scenic tour of the 78 mile line.Warren gives us plenty of history. Some scenes are natural sounding steam train action. A scene with lumberjacks using hand held saws to fell a big sugar pine is a nice touch. The Yosemite Valley operation is described in detail. 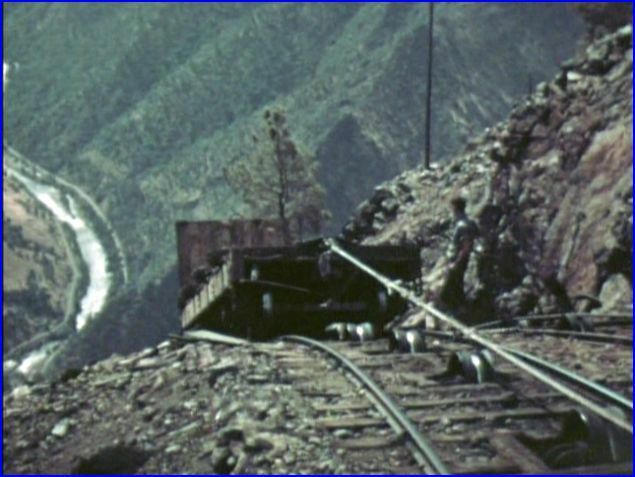 A bunch of color footage that even includes the steep, cable operated ‘incline’. The incline with a 1400′ drop, is very unusual. A fine sequence, shows the incline operation. At Merced Falls, a visit inside a mill and a log drop into the water is informative.That wood mill machinery is noisy. Excellent coverage! The Amador Central has a black & white segment with interviews. The trains are shown as the people supply various commentary. Sound quality is a little rough, as we cut to a portion of a circa 1960’s show. There is a lot of film, some handheld camera , looks shot from the front of the locomotive. A Baldwin S12 is the main power. Warren gives history and updates on the line. The sound returns to normal. There is more to see, and we continue the chapter. Nevada County Narrow Gauge. This line ran from Colfax on the Donner Pass route of Southern Pacific. One man’s interview add some personality. Black & white films. A 1938 film. The excursion train travels the line. The senior citizen, was a boy on that 1938 train. You’ll see a partial of that boy, with his box camera. Switching is also viewed. Number 9 then gets paced with it’s reassembled mixed train. Pretty awesome for 1938, on a shortline! The high vantage point gives a good view of the little 3 footer, as the train traverses the line.Switch to color brightens things up. Looks like camera is on top of a boxcar. The tale ends with 1943 views of the abandoned line being removed via work train gang. 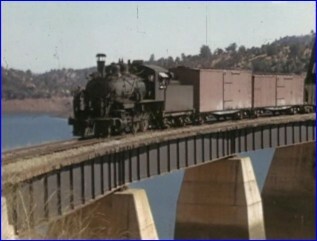 Hetch Hetchy Railroad was a 68 mile standard gauge line. It was built for construction of the O’Shaughnessy Dam. Besides the 1920’s film, there is color film. 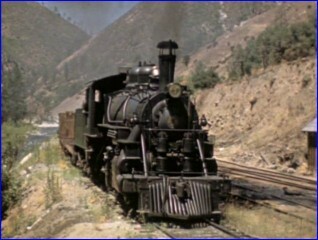 A 1947 single coach fan trip was filmed in color by Louis Stein. Here is some 16mm color film. How rare is that? The last run in 1949. A strange looking railbus, carries a few fans. 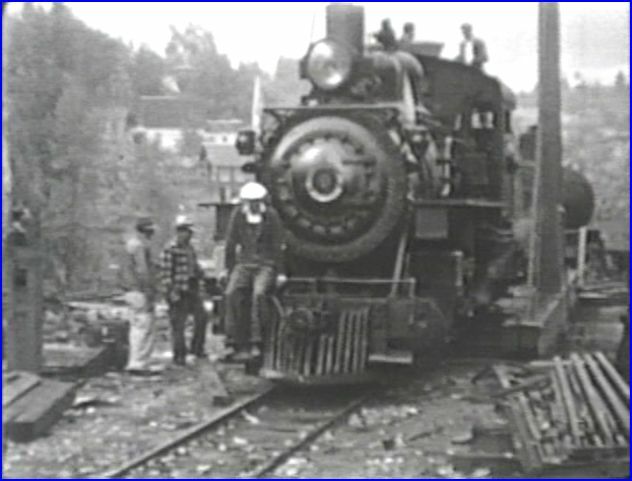 The demise of Hetch Hetchy is also shown, as the trackage is torn up. This is another fine release from Catenary Video. A fine presentation by Warren Haack. Suitable for the entire family. A very worthwhile program. 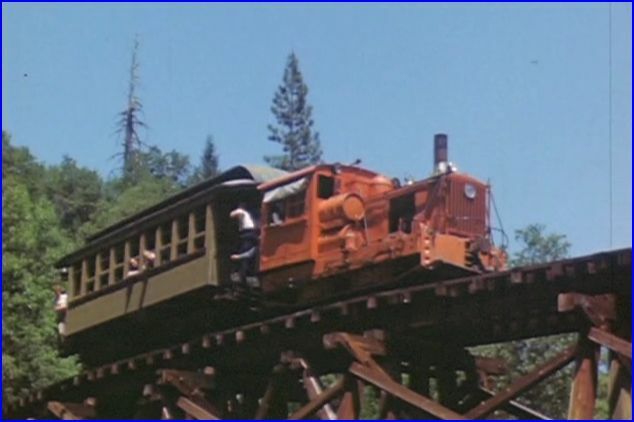 This entry was posted in ATVR Reviews, Catenary Video, Steam Train Reviews and tagged American Train Video Reviews, California, Logging, narrow gauge, new releases, steam train, Train DVD, train video, train video reviews by William J. Hudson. Bookmark the permalink.